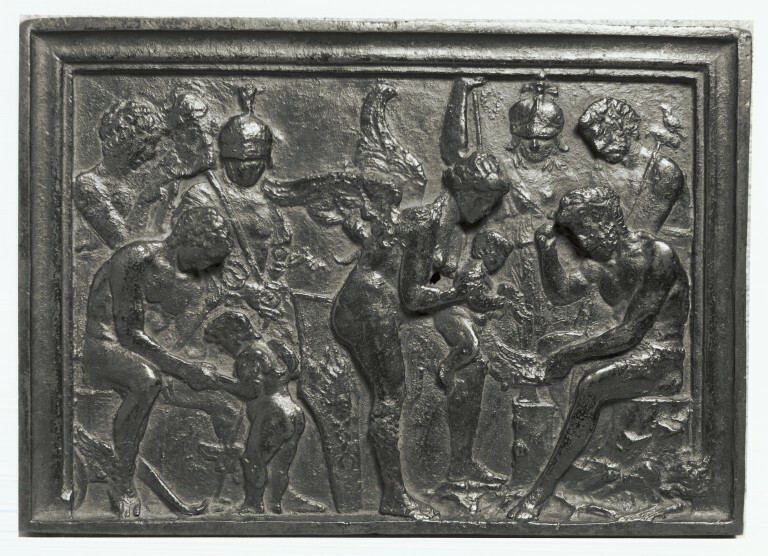 This is a bronze relief ascribed to Vittor Gambello (Camelio), made in Venice or Padua in the late 15th or early 16th century. The relief represents Vulcan forging the wings of Cupid and Cupid instructed by Mercury. Minerva, Mars and other gods are also introduced. Two versions exist, the one here at the Victoria and Albert Museum and one in the Ca d'Oro in Venice. This relief might reproduce a lost original for on both versions an exectuion of detail is missing. 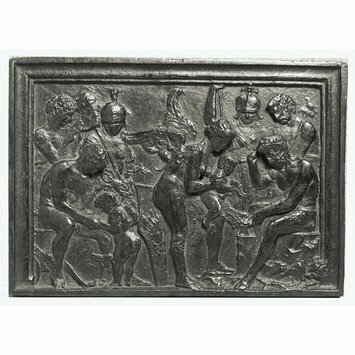 In around 1495 the relief was apparently well known in Venice as it is described by Francesco Colonna and even copied by Carpaccio. The relief is ascribed to Camelio, but this fact is under doubt and does not convince. Camelio, also called Vittore Gambello was a Venetian sculptor, goldsmith, coin-engraver, founder and medallist (b. 1460; d. 1539). His career ranges from 1484 - 1523. The invention of cutting dies in steel is attributed to him. This technique allowed more minute work to be introduced into medals, marking a new era in medallic engraving. Vulcan repairing the wings of Cupid, and Cupid instructed by Mercury. Minerva, Mars and other gods are introduced. This object was purchased in 1865 for £19 from a sale at the Pourtalès Collection in Paris, where many Italian art objects were being sold as a result of their flooding the market after the Napolenic wars. Ferino-Pagden, Sylvia, Isabella D'Este: Fürstin und Mäzenatin der Renaissance, Vienna: Kunsthistorisches Museum, 1994.